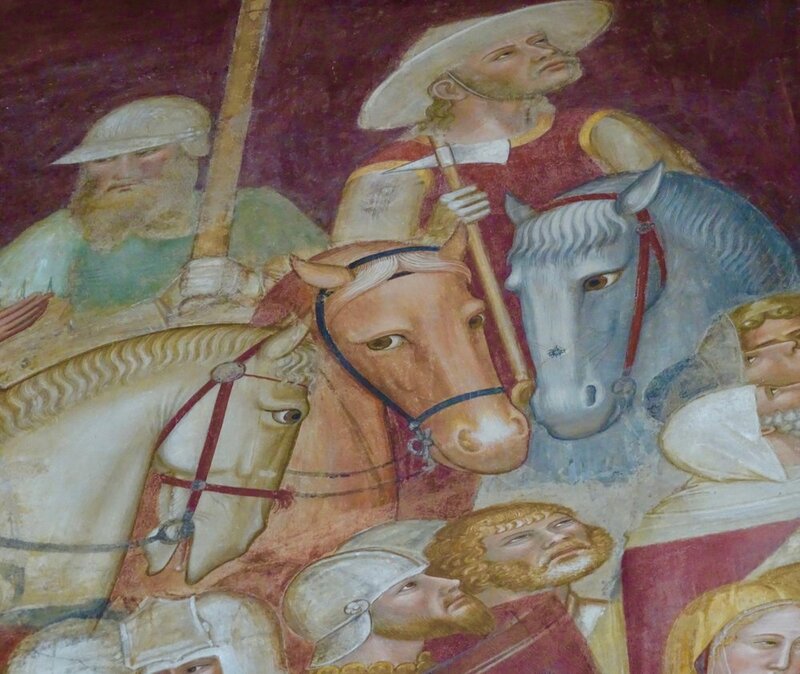 While the Renaissance frescoes of Florence can be glorious, passionate, beautiful etc sometimes they can seem overwhelming, especially if you are traveling with kids, or even young adults. So one of my pleasures is finding the fun. In the 14th century, before the best (now famous) artists were renowned and respected for their art, being an artist was a simply a job. Artists were tradesmen with a trade which was the ability to paint to a subject specified by the church and they painted what they knew. They painted people, castles, saints, devils and of course all the characters from the Bible stories, and frequently added in horses, cats, dogs and even the occasional pig. For me there is great pleasure in finding the footprints of the artists in the non-formal characters and seeing how they enjoyed the world through these creatures. 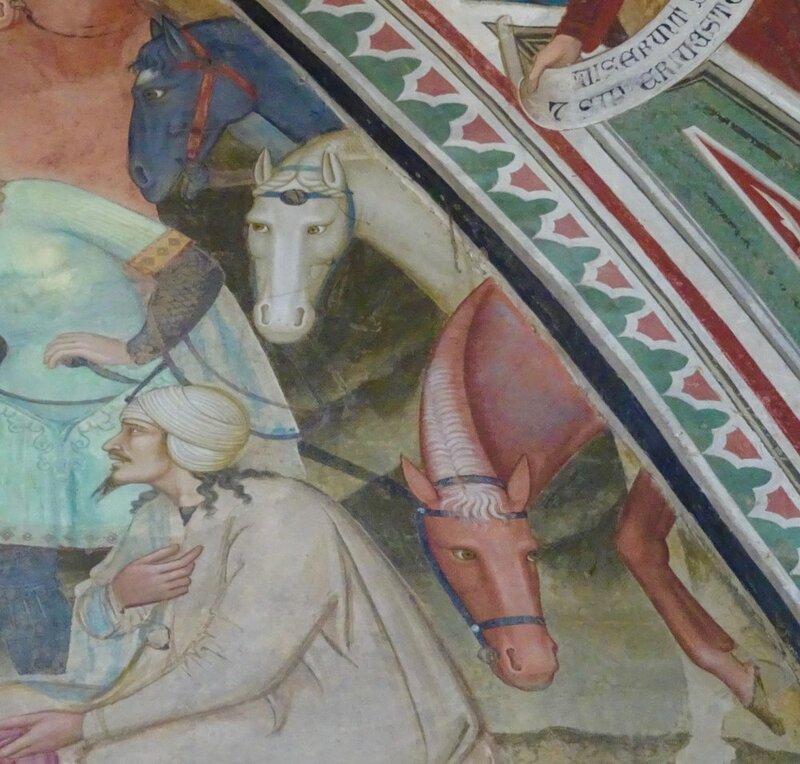 One fabulous example of this is the horses in the Spanish Chapel of Santa Maria Novella in Florence. It is a glorious, large, high ceilinged room originally designed as a chapter house for the monastery. Built in 1350 and painted in 1366-67 it depicts the Passion of Christ bearing the cross, the Crucifixion and the descent into Hell. Serious subject matter in front of the artists imagined Jerusalem (which looks like an Italian Medieval city) and yet... the humor is in the horses watching with knowing eyes and clearly talking about what they are seeing. These horses have more expression than any of the humans depicted! 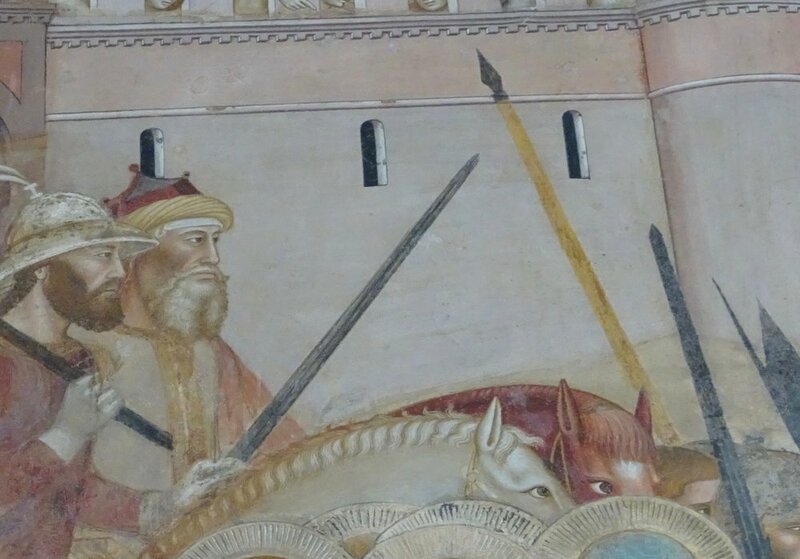 The magic of many 14th century frescoes is to find the humor and the humanity of the artists. In the main church there is a fresco of a farting dragon. Seriously. Rick Stevens points this out in his guide to Florence but until my daughter and I went to find it (when she had just about had enough of Florentine frescoes) it was as described. Too funny and I do wonder if the artist did it intentionally. Can't you just imagine him going home to his wife and saying "hey I pulled a fun one today, wonder if Father Peter will notice?" And once you really start looking the humor is everywhere. Take these devils, also from the Spanish Chapel... a play on people the artist knew perhaps?